"Dear all at Brilliant Fireworks. You lived up to your name. It was the most amazing ending to the most amazing day. Everyone is still talking about the display. It was the perfect surprise for our guests. What we particularly liked about the display was how unique and romantic you made it. It felt very personal to us. Thank you for all your hard work and for being so professional and friendly from start to finish. We will definitely be booking you again!" "...At the end you had 100 smiling faces looking skyward! I would have no hesitation in recommending you to family and friends. It is great to work with a company who deliver what they say. Thank you again from the very happy parents!" 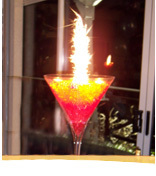 An outside firework effect brought inside that will surprise guests/clients at any event. 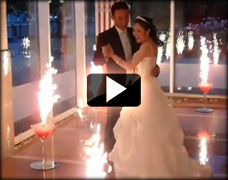 Indoor pyrotechnics can be a "Brilliant" way of creating an finale or to emphasis a key stage in the event proceedings (i.e. Awards ceremony, weddings, birthday speak, etc). With our expert advice and skilled technicians, we can still provide that moment of firework excitement with venues who have no grounds. Create a trendy and chic centrepiece which will make your event memorable. Create a breathtaking effect which illuminates the entire room. Indoor shows require more planning than other shows and generally require a site visit by one of our professionals to evaluate the possibilities. We can work to a design brief or develop ideas completely from scratch. We are used to optimising budgets to maximise the results you get for your money. Unusual and creative designs are our speciality - we think outside the box and achieve GREAT results. Our approach to displays starts from your first contact with us. A single point of contact - We understand how difficult and sometimes daunting it can be to organise a display, But don't panic - help is at hand. We will do a site assessment and talk over any problems or requirements. Our designers have built up a reputation for fresh and original display designs. These designs form the keystone of our thinking and help us create displays that stand out from the crowd. We may have our eyes in the sky, but in the office, we are all business. We discuss size & impact. We will draft options for your approval. We will make any alterations to the design, if needed. Whatever the challenge, we have the solution.